Seemingly out of the blue on Tuesday (July 19), officials from the the DOJ swept into JFK International Airport, brandishing handcuffs and pushing travelers out of their way. They were there to nab one man, whom they found at a terminal waiting for a UK-bound plane. Before a crowd of several hundred, the authorities slapped cuffs on Mark Johnson, HSBC Holdings Plc. 's (NYSE ADR: HSBC) global head of foreign-exchange cash trading. He was under arrest on federal charges of "front-running." All HSBC had to pay the feds was a portion of a fine that, in total, amounted to half of what it reaped from its traders' illicit scheme. As did his partner in crime, Stuart Scott – former head of cash trading for HSBC's Europe, Middle East, and Africa accounts. The DOJ issued an arrest warrant for Scott on Tuesday as well, but his whereabouts are as-of-yet unknown. Together, Johnson and Scott allegedly rigged a trade involving an unnamed oil and gas company that wanted to exchange U.S. dollars with British pounds. The two executives bought pounds sterling for themselves before handling the order, knowing that such a large transaction would push up the value of the currency. They brought in a total of $3.4 billion for themselves with the trade. Johnson and Scott are the first executives ever to be individually charged for foreign-exchange rigging. Of course, HSBC also profited from their transaction. The firm raked in $8 billion, reported CNBC yesterday. It was fined (but not formally charged, of course; it's a big bank, after all) in 2014 as one of five big banks to reach a combined $4.25 billion settlement with U.S., British, and Swiss regulators over currency rate manipulation. But that's it. Essentially, the institution had to pay a portion of a fine that, in total, amounted to half of what it reaped from Scott and Johnson's scheme. You see, legislators in Congress have been pressing the Justice Department to pursue criminal charges against Wall Street firms and their shifty executives for years now. Since their pleas for justice initially went ignored, members of Congress took matters into their own hands three years ago. The House Financial Services Committee initiated its own investigation into HSBC's underhanded practices in March 2013. Immediately, the DOJ's and the Department of the Treasury's walls went up. The two institutions failed to comply with the committee's request to obtain relevant documents, which led to the necessity for "the issuance of subpoenas to both agencies," the committee's July 11, 2016, report states. 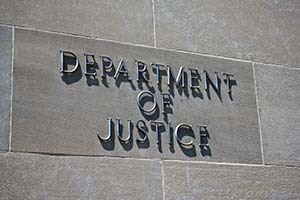 Senior DOJ leadership, including then Attorney General Eric Holder, overruled an internal recommendation by DOJ's Asset Forfeiture and Money Laundering Section to prosecute HSBC because of DOJ leadership's concern that prosecuting the bank would have serious adverse consequences on the financial system. Notwithstanding Attorney General Holder's personal demand that HSBC agree to DOJ's "take-it-or-leave-it" deferred prosecution agreement deal by Nov. 14, 2012, HSBC appears to have successfully negotiated with DOJ for significant alterations to the deferred prosecution agreement's terms in the weeks following the Attorney General's deadline. DOJ and federal financial regulators were rushing at what one Treasury official described as "alarming speed" to complete their investigations and enforcement actions involving HSBC in order to beat the New York Department of Financial Services. In its haste to complete its enforcement action against HSBC, DOJ transmitted settlement numbers to HSBC before consulting with Treasury's Office of Foreign Asset Control to ensure that the settlement amount accurately reflected the full degree of HSBC's sanctions violations. The involvement of the United Kingdom's Financial Services Authority in the U.S. government's investigations and enforcement actions relating to HSBC, a British-domiciled institution, appears to have hampered the U.S. government's investigations and influenced DOJ's decision not to prosecute HSBC. Attorney General Holder misled Congress concerning DOJ's reasons for not bringing a criminal prosecution against HSBC. DOJ to date has failed to produce any records pertaining to its prosecutorial decision making with respect to HSBC or any large financial institution, notwithstanding the Committee's multiple requests for this information and a congressional subpoena requiring Attorney General Lynch to timely produce these records to the Committee. Attorney General Lynch and Secretary Lew remain in default on their legal obligation to produce the subpoenaed records to the Committee. DOJ's and Treasury's longstanding efforts to impede the Committee's investigation may constitute contempt and obstruction of Congress. Those are the precise words from the committee report's "Executive Summary." In 1998, Money Morning's own Global Credit Strategist Michael E. Lewitt visited a prominent money manager in New York City who was later felled by Bernie Madoff. Lewitt, of course, knew then that Madoff's profit model was impossible. But here's what people don't know about the infamous Ponzi schemer to this day… He's still calling all the shots from prison. For more up-to-date info regarding the DOJ's sudden moral pursuit to prosecute Wall Street criminals, follow Money Morning on Twitter @moneymorning and on Facebook.